While the ultimate goal for most of us may be a permanently healthy diet, let’s be realistic: that takes a concerted and educated effort that often may fall to the wayside under the stress of busy schedules and stressful life events. Pregnancy can be a whole other beast; morning sickness, general discomfort, and, that awful temptation–food cravings, are now all regular parts of the regimen. Despite these obstacles, eating well during your pregnancy is vital to you and your baby’s health, so strap in, read up, communicate with your healthcare professionals, and don’t worry: you can still indulge in some of your guilty pleasures. Just do it wisely. With the key factors below, you can be sure to have a pretty healthy diet during pregnancy. Let’s be clear about one thing upfront: “diet” in this context does not mean that you should be eating less food than usual. On the contrary, you should be eating roughly 300 extra calories in the day to ensure that you and your child are receiving enough energy. When we talk about a healthy pregnancy diet, what we’re instead referring to is the way in which you spend those calories. Not eating enough is just as damaging as eating too much or eating the wrong kinds of food. Your plate should be colorful (perhaps like your language, while you eye the wine or caffeine teasing you from the back of the pantry), and include a spread of protein, carbohydrates, fats, and produce. The word “fat” (just like the word diet) has something of a bad rep these days. Contrary to what some of the general public might tell you, fats are a necessary part of our diet. The nuance comes down to what kind of fats you’re consuming. Monounsaturated and Polyunsaturated fats are what you should be aiming for, as they lower cholesterol and reduce the immediate risk of heart disease. These “healthy fats” can be found in foods such as olive oil, hemp oil, coconut oil, avocados and a big variety of nuts. Replace saturated fats (which, alternatively, raise your cholesterol and work against your heart’s health) with these options instead, and still moderate your consumption to healthy fats being responsible for 25% of your daily caloric intake. Proteins are especially significant in the second and third trimesters of pregnancy, during which the baby’s growth and development need some extra support. The daily recommendation is 3 servings or 75-100 g of protein per day in a pregnant woman’s diet, regardless of trimester. There are plenty of options to choose from in varying your protein consumption but try to avoid fish with high levels of mercury, and aim for protein sources that also pack an iron punch, such as beef, chicken, and certain seafoods (sardines are on the list). If you’re vegetarian, lentils are a great option and you can always supplement with spinach and other iron-dense vegetables. And, bonus points: dark chocolate is also an iron-rich food! Our main source of energy during pregnancy will stem from carbohydrates, with a recommended daily dosage of 6-11 servings/oz per day. Fortified breads and cereals carry the necessary amount of Folic Acid as well, if a supplement or vitamin is not your favored path. Whole grains are rich in fiber, iron, B Vitamins, and some protein. The rule of thumb with carbs as with vegetables, is that the darker colors tend to be more nutrient dense. So skip the Wonder Bread and white, refined grains and opt instead for Whole Wheat/Whole Grain options. Fruits and Veggies provide a wide array of nutrients necessary to a mother’s healthy and their baby’s development. Some of these vitamins and minerals can be found in other foods and/or taken in pill form. Always consult your physician before investing in supplements. Vitamin C helps us produce collagen, which assists in the development of cartilage, bones, tendons and skin. It’s a structural protein. Vitamin C also helps fight infections and maintain a healthy immune system. It’s a water soluble nutrient so you have to replenish your source daily, your body cannot store it for continued/later use. Too much Vitamin C can be detrimental to your and your baby’s health, though. During early pregnancy especially, avoid Vitamin C supplements. Anything above the 2000 mg limit could invoke Vitamin Toxicity in the body, resulting in nausea, vomiting, nerve or liver toxicity, diarrhea and dehydration. 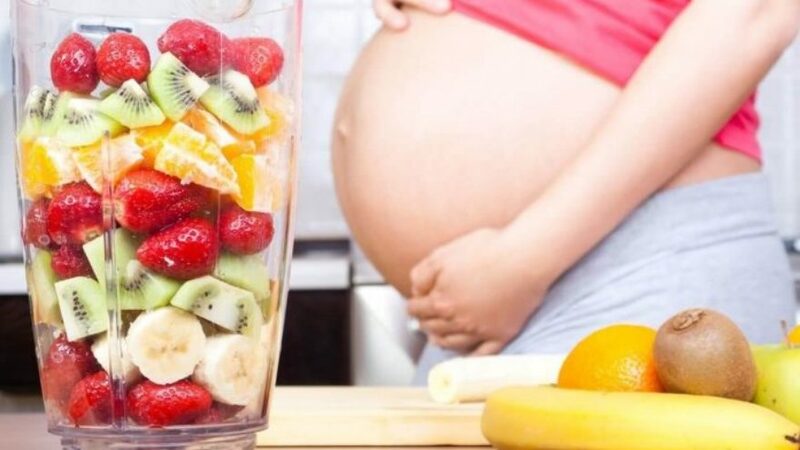 A pregnant mother needs roughly 80-85 mg of Vitamin C (some sources cite up to 120 mg daily) and 0.4 mg of Folic Acid (2-4 servings of fruit, 4 servings of vegetables). Folic Acid is a form of Vitamin B9 and also known as folate. It helps protect against Neural Tube Defects (NTDs): birth defects of the spinal cord or brain. NTDs affect about 3000 pregnancies per year in America. NTDs can sneak in during the very early stages of pregnancy, before some women even know that they’re pregnant, so start taking supplements that include Folic Acid early if you and your partner are engaged in family-planning. Folic acid also is responsible for the creation, fixing and functioning of our DNA. It is essential for the development of your baby, helps fight anemia, and assists in the production of red blood cells in our bodies. 0.4 mg or 400 micrograms is the standard recommendation but some doctors may suggest that you take between 800 and 1000 micrograms daily. Exceeding the 1000 microgram limit is likewise dangerous to your health, particularly affecting Vegans who are at risk of Vitamin B12 deficiency. An overflow of Folic Acid in the body will make that particular strain of malnutrition difficult to diagnose. Vitamin D assists in the body’s use of calcium and phosphate, supporting strong teeth and bones. The recommended daily dose is 600 IU (international units) but studies show that taking up to 4000 IU (the maximum) per day decreased the risk of pregnancy-related health complications. Vegetables, fatty fish, and sunshine are all good sources of Vitamin D.
Iron is particularly important during pregnancy due to the mother’s increased chances of anemia. The daily recommended dose is currently at 27 milligrams. The extra iron supports red blood cells, the placenta, and overall development, as well as helping to carry oxygen from your lungs to the muscles of both you and your baby. Additionally, iron leads the fight against such pregnancy pitfalls as fatigue, weakness, irritability, and depression. Iron deficiencies and anemia can result in babies being too small or born too early, but is relatively easy to ingest in a varied diet or with supplemental assistance. The CDC recommends taking supplements carrying the recommended daily dosage as soon as you begin your prenatal appointments. Many prenatal vitamins include iron in their ingredients. If you grew up under the same parental and educational adages as most, you’ve heard how important it is for children to “drink their milk so that they grow up to be big and strong.” As trite and overused as that may now feel, there is some truth to it. Milk carries a great deal of calcium, which is a necessary nutrient in fortifying our bones and teeth, but milk is actually not the best way as it doesn’t have as much calcium as other foods and with the hormones and feed that most cows eat, it is actually harmful to most people. Calcium also fights blood clots and assists muscle and nerve function. The daily recommended dose is 1000-1300 mg, and this mineral can be found abundantly in such foods as yogurt, soymilk and leafy greens. If dairy is not in your diet, many alternative fortified milks, breads and cereals can be viable substitutes. Just make sure to check the nutrition facts on the particular brand you intend to buy. If you do get milk, make sure it is organic so it is free from all the harmful hormones they pump into conventional cows. Another important (and prevalent) mineral to consider is Zinc. This is the nutrient partially responsible for our body’s production of insulin and enzymes. Zinc supports your baby’s construction of cells and DNA throughout the pregnancy. Additionally, Zinc strengthens our own immune systems, so if you’re starting to feel a little under the weather, try upping your dosage. 11-13 mg is the standard recommendation and 35-40 mg is the ceiling on this one, not to be exceeded. If you’re taking Zinc as a supplement, consume it with a full meal or right before bed; it can cause mild to moderate nausea on an empty stomach. Look, no one expects perfection. The bad news is you can follow this diet regimen vigorously and still wind up pining over sweets or BBQ flavored chips. Exercise caution; over-indulging in cravings can lead to gaining more weight than is advised during pregnancy, and difficulty in losing it again during the postpartum phase. Consuming nutritionally empty calories can also lead to birth defects or health complications for your baby, as they are not getting the vitamins and minerals necessary for healthy growth and function in the womb (and outside of it). But giving into your cravings is not a damning offense, as long as you do it consciously and in moderation. Carefully measure out your serving sizes to avoid caloric overload (do not eat straight out of the container, as tempting and effortless as that may seem) and savor your treats when you do indulge. Track your calories and nutritional intake if you’re worried about going astray. If you find it difficult to eat certain recommended foods, try combining a small portion of what you’re craving with a larger portion of a more nutritionally dense option. There are a variety of delicious foods out there that all fall under the approved category, so invest in some pregnancy-related cookbooks, do a little research, and try something new! You may find you wind up craving some of these “boring, healthy” options even after baby is born.